Mon - Wed 9am-5pm, Thurs 9am- 8pm, Fri 9am-6pm, Sat 9am-2pm. 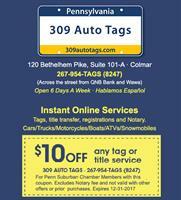 We are an authorized Penndot full service agency providing vehicle title , tag and registration services. We also offer Pa Notary services and are authorized by Pa Fish and Boat commission for title and registration of all types of watercraft. In addition we are an authorized Dept of Conservation & Natural Resources (DCNR) agent for title, tags issue and registration for snowmobiles and off road vehicles. Conveniently located on southbound side of Bethlehem Pike Rt 309 in Colmar directly across street from WaWA & QNB Bank next door to the Golden City restaurant.